Who said Thursday Night Football wasn’t fun? The Rams traveled to San Francisco to take on the 49ers in a divisional battle on Thursday, and boy was it a lot of fun. It was the exact opposite of what we’re used to when it comes to Thursday Night Football. It was so much fun in fact, that the Rams and 49ers combined for the highest scoring game in Thursday Night Football history. The previous highest scoring game was a game between the Chargers and the 49ers back in 2014. The game was nothing short of exciting from the opening snap until the end. It started as you might expect it to; with an interception of Brian Hoyer that almost went for six. Imagine being the 49ers defense, and your offense gets the ball first, but before you can even finish your Gatorade you have to go on the field. 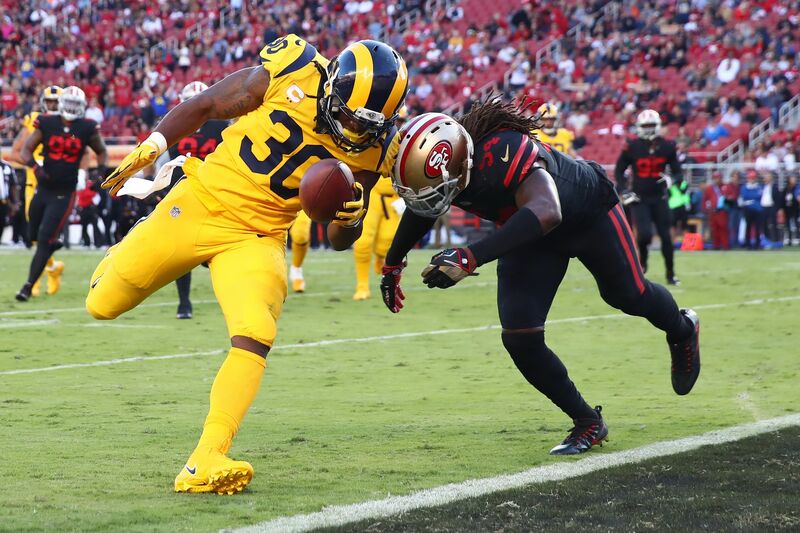 Rams running back Todd Gurley basically owned the first half, and made fantasy owners around the country happy campers. Three first half touchdowns from Gurley was enough to give the Rams a 24-13 lead going into the second half. On the flip side Carlos Hyde almost had fantasy owners ready to pull their hair out. Hyde left the game in the first quarter with a hip injury, and I’m sure there were people including myself that thought the injury cycle was starting all over again. Hyde would return, and finish the night with two scores of his own. The 2016 number one overall pick Jared Goff is starting to get it done in LA under Sean McVay. McVay, if you didn’t know, doesn’t watch the defense when they’re on the field. He’s the head coach, offensive coordinator and play-caller. So while the defense is on the field he sits on the water cooler, and makes his adjustments for the next drive. Goff finished 22-of-28 for 292 yards and three touchdowns, two of them to Sammy Watkins. The Rams tried extremely hard to blow this game. They led 41-26 with 6:35 left in the fourth quarter, but after the 49ers scored to make it 41-33; Pharoah Cooper fumbled the ensuing kickoff, and the 49ers came within a two point conversion of tying the game. The Rams are now 2-1, and they lead the NFC West. They’re also scoring a lot of points in the process. Maybe more head coaches should sit on the water cooler while their defense is on the field. The Rams go to Dallas next week, and the 49ers will be in Arizona.